When I started ‘Mama Lotties’ I had a vague idea of what I wanted from it. I wanted a place where everyone could enjoy not just great food but food that would bring up feelings of nostalgia and feelings of love and happiness. The idea of Mama Lotties has grown since its inception and become much more than a recipe website. It is a community, a community of Facebook followers and community of those at home who use the website, the book or even the videos to recreate the dishes in their own way and create new memories of their own to share with us. This is all thanks to our ‘Mama family’, our community of followers who may not exactly be a Mama (granny) just yet, but are Mamas of the younger generation, sharing their recipes with us and keeping the traditions of homemade food alive. Carloti, the inspiration behind Mama Lotties has been cooking from a young age after taking over the kitchen from her mother. Carloti has always been the head of the family with regards to food, preparing every type of Gibraltarian and Mediterranean meals for the large family gatherings on a regular basis. Carloti is not forgiving when it comes to cakes either, as you can see from her selection of mouth-watering treats. A stickler for tradition, you’ll find this Mama at the fishmongers weekly, stocking up on the week’s fresh supply of seafood and come 5pm she’ll be serving up a hot cup of coffee and a slice of cake. 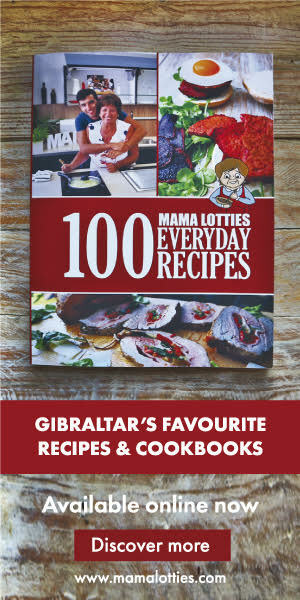 Justin (or Mama Jay) as some refer to him now is the brainchild behind Mama Lotties, setting up a platform where Gibraltar’s recipes could be shared with anyone in the world, eventually translating this to print form and expanding onto video. Justin continues to test out recipes, making his own variations to the traditional or simply throwing fresh ideas into the mix. Lorraine grew up watching her grandmother and mother in the kitchen, helping to prepare the daily meals for the family. Seafood has always been a big part of her life and recalls how her uncle used to turn up with freshly caught live crabs before helping her mother cook them up. What meals do you enjoy most? Seafood is a must in my diet and usually the best dishes are the simplest ones, which makes it so easy to enjoy as part of my lifestyle. Rose Carter is a granny (Mama) to 4 grandchildren whose love for cooking comes from helping her late mum who was a great cook, since an early age. Maria Luisa Pau has an undeniable passion for cooking and what she does is done with a great deal of love, so you just know it must taste good. Maria Luisa enjoys trying food from different countries and that inspires her to try innovative plates. Mari is a retired learning support assistant and started taking more of an interest in cooking now that she has a little more time. Starting off with Facebook and finding so many shared recipes around her, she decided to try out a few for herself. Mari prefers baking cakes to savoury dishes which lead to her greatest baking success so far, a decadent Christmas cake and homemade paté. 43 year old Tracey Bonavia is a natural in the kitchen. Cooking has always been a big part of her family from her granny who is 98 years old and still making her Potajes, to her mum who is also an excellent baker. Tracey loves cooking but finds little spare time to be able to indulge more so, so she tends to cook quick easy recipes. Meet Ngaire whose passion for cooking is as much a labour of love as an enjoyment, especially so watching her loved ones left satisfied and still asking for a second serving. A really great idea. Well done all.